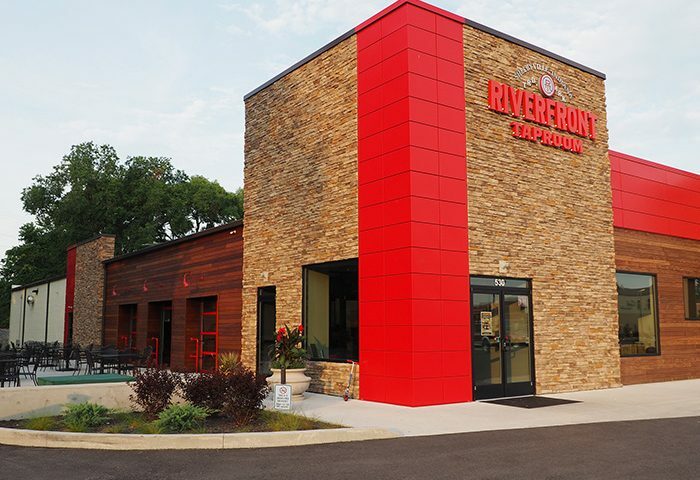 Riverfront Taproom | James Babcock, Inc. Details: Shelbyville Indiana has a new brewpub. The Riverfront Taproom is a new “destination” that anchors the Riverfront Development District. It’s a million-dollar investment that’s helping bring Shelbyville into the 21st Century with the district project. The Riverfront Taproom is owned by multiple residents that grew up in Shelbyville and are excited to invest in their community. Riverfront Taproom provides a missing part to downtown Shelbyville. The location used to be Kiefer’s Furniture. The newly remodeled brewery is 9,500 square feet. It seats 250 people. The full-service bar includes 32 taps from Indiana craft brewery favorites. Seasonal and specialty craft beers will be made in the Riverfront Taproom’s on-site brewery operation. You can do a wine tasting from Simmons Winery’s collection in the Taproom’s wine tasting area. Do you have a party or meeting? The AV-equipped banquet room accommodates up to 45 people. The overall project was not difficult. The open floor plan of the brewery makes it accessible and provides the space to seat as many people as possible. The openness also creates the visual challenge for the installation of the exposed electrical conduits. The aesthetics of installation are important. We provided power to MEP and food service equipment. This was done in collaboration and coordination with all trades.